Winter coats came to many of Erie's inner-city children this week through three of our ministries: Emmaus Ministries, St. Benedict Child Development Center and the Neighborhood Art House. Operation Warm has provided 600,000 coats to needy kids across the country over the past 11 years but this is the first year the program has been in Erie. The Child Dev. Center and the Art House were two of eight local sites chosen to receive winter coats. Over 200 coats were delivered and given out to their children. A big thanks to our local PNC bank who sponsored the coats for these families. Emmaus Ministries (soup kitchen, food pantry, women's advocacy, Kids Cafe) partners with a local Catholic parish each year that collects coats and other warm weather "gear"--sweaters, gloves, hats. 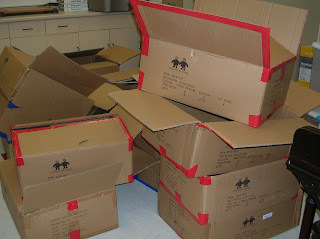 Monday the parish delivered this year's donations which included over 300 coats for Emmaus families. 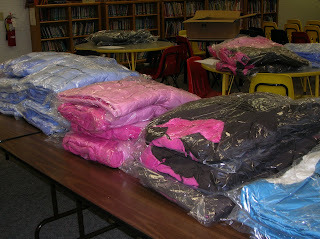 Operation Warm supplied colorful, hooded boys and girls winter jackets, sizes 4-18.